I am sure that most of us before going for shopping on a certain occasion, we have to dig up our mind to draft a shopping list. However, after shopping, we unfortunately would say: "Oh, I forgot to buy this and that!". 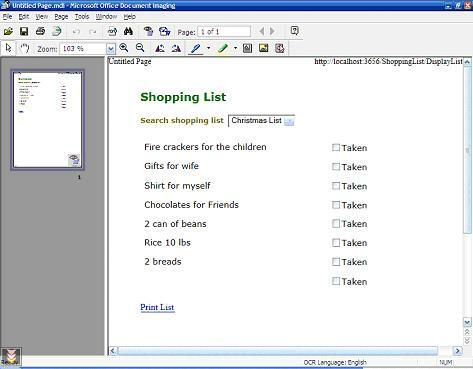 This tutorial will explain how to build a shopping list using ASP.NET 2.0 with MS SQL database. Based on this article, some cool technical stuff in Visual Web Developer will be used to facilitate our work. You can download Sample Project Shopping List related to this tutorial. There will be 2 tables for holding information of the shopping list and the items pertaining to a specific shopping list. Figure 4. 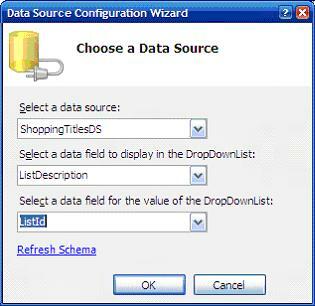 Using a dropdown list for populating available shopping lists, and datalist for populating the list of items. The items will be in a tabular format. Figure 6. 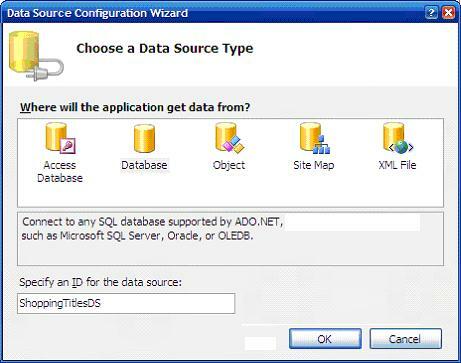 Set the data source to the new database created and save the connection string to the web.config file when asked to. 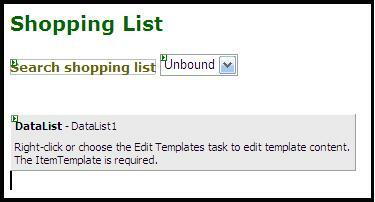 To create a new shopping list, the title of the shopping list, a title and the list of items should be supplied. We will assume that the items will be separated by linefeeds. So, each item in the list will be found on a separate line. The next step is to insert the information in the tables; and 2 stored procedures will be used for that. They are simple stored procedures as illustrated below. 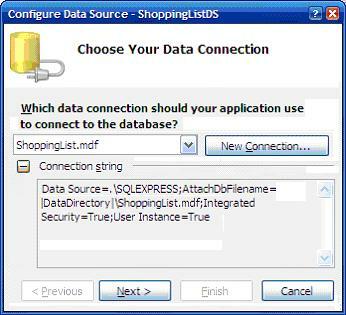 From the code above, the title associated with the shopping list is inserted in the database. An ID is associated with the description of the shopping list. The ID will be useful to group together the items belonging to a specific list. 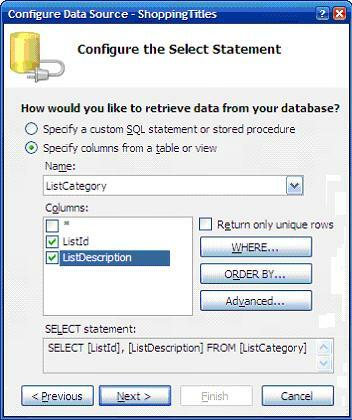 Having the stored procedures at hand, they have to be called from the ASPX pages to complete the "Create a new shopping list" functionality. 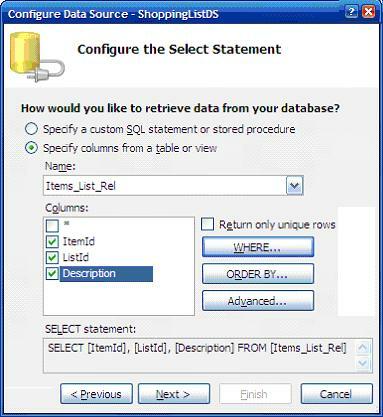 The above code snippet calls the stored procedure for inserting a new shopping list title. To get the list of items, separated by linefeeds, the above code snippet uses the very handy split (vblf) which returns an array of string with each element as the item. 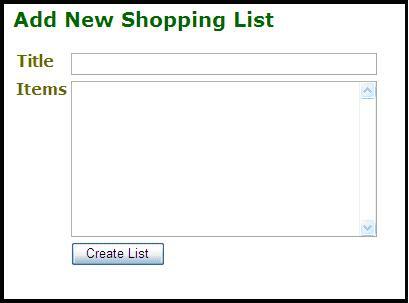 Then, each item in the array is inserted in the database to build the shopping list as illustrated below. 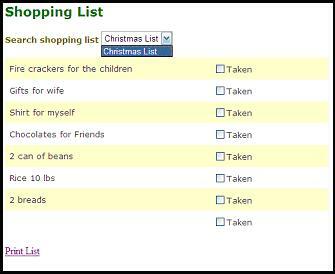 To retrieve the shopping, list, we will make use of the powerful DataList control gifted to us. It will be binded with the combolist for retrieving a specific shopping list. 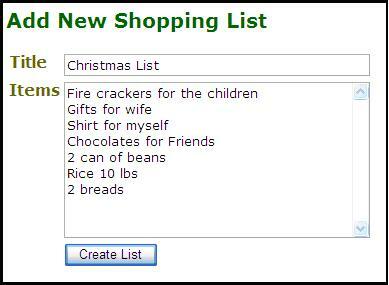 First, we need to populate the ComboList with the available shopping list titles. Do not forget to set the AutoPostBack of the combolist to True. 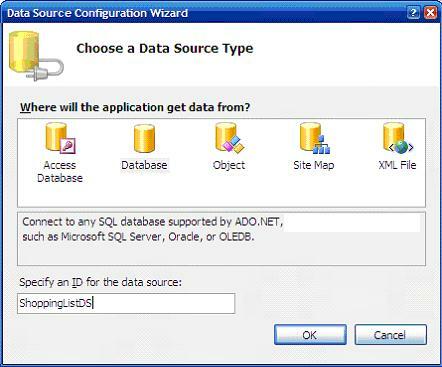 We first create a new data source from the wizard. Figure 8. Choosing the connection of the datasource. Figure 9. Chose the table named "List Description" select both columns and then click on Next. You can test the query in the next step to make sure everything is working perfectly. Figure 11. 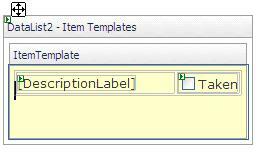 Selecting all the fields from the "Items_List_Rel" tables and click on the "WHERE" button. Figure 12. 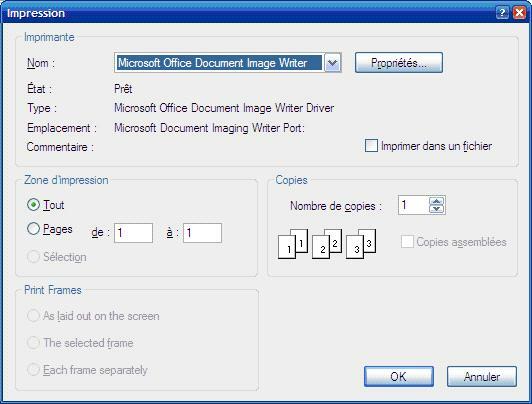 The condition should be configured as in the picture above. 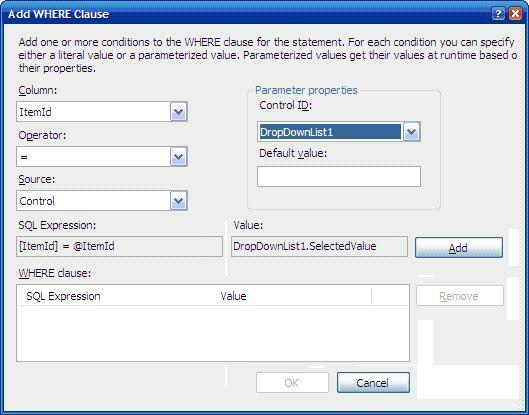 Note how the value is obtained from the DropDownList and binded to the dataset returned. Then, click on the "Add" button. You can test the query to make sure everything is working properly after the above step. We will customize the template and make the information appear in tabular format. Figure 13. Item template is formatted as above. The AlternatingItem Template is just a Copy Paste of the Item Template. A hyperlink is placed on the page and the following associated with it.